I've always loved cooking. I can actually trace my cooking-love back to an exact day when I was about 8: my guitar teacher recommended that I quit because my hands were too small (I'll never forgive him for that) and I was a wee bit heartbroken so my mum said that for the hour that I would've been in guitar lessons every week, she would teach me how to cook. I'd always watched her cook but I was finally old enough to learn for myself and I couldn't wait. No joke, I've been cooking and baking ever since. The past year or so, I've been cooking a lot more and for the past 4 or 5 months, I've pretty much taken over the role as family chef, cooking at least 5 meals every week. I freaking love it and I don't think my family mind it at all. I've made a couple of pretty crap meals but I'm getting better every day and I never get bored. To accompany my cooking-love, I've been building up my own little collection of cookbooks so I don't always have to use my mum's. Not including baking books (I have a lot of those from years and years of baking, especially when I was younger), I have 5 of my own cookbooks so I thought I'd pick my favourites and share them with you. Little side-note: I'm vegetarian so my cookbooks kinda fit with that. I'm also very gradually cutting out dairy. First up is 'Hemsley & Hemsley, The Art of Eating Well' by Jasmine and Melissa Hemsley. This is a gorgeous book full of super healthy recipes, with beautiful photos and a fair bit of really useful nutritional info. I actually just sat and read this when I got it which it a wee bit sad. It's not a vegetarian cookbook but it does have a good selection of meat-free recipes so it should suit most diets pretty well. My one complaint with this book is that it does have quite a few rare ingredients that I've never heard of let alone seen in supermarkets so I tend to substitute them for more common alternatives. Some of the recipes are on the more complicated side but they're explained clearly so it shouldn't be too much of an issue. My favourite so far is the Malaysian lentil and squash curry, but I used courgette instead of squash. It was lovely. Next is 'Mildred's: The Vegetarian Cookbook' by Sarah Wasserman and Dan Acevedo. Another gorgeous book but I like this one a bit more than the last because it's really fuss-free and uncomplicated. It has some really different and interesting recipes in it but they make it seem really quite simple. Vegetarian cookbooks can sometimes be quite intimidating but not this one. The photos are beautiful and make everything look amazing, and I really like the way it's written. The ingredients aren't super fancy and it's all vegetarian which is a plus. It has an amazing guacamole recipe in it and a pepper and sweet potato soup which my full family loved. It's just great. 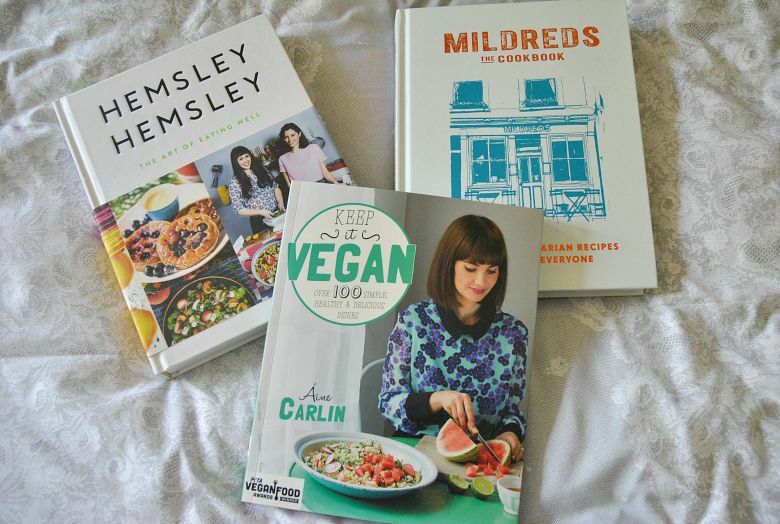 Lastly is my newest one but potentially my favourite: 'Keep It Vegan' by Áine Carlin. I've been looking into veganism for quite a while now as it just kinda seems like the natural next step for me, as I've been vegetarian for a couple of years (I was vegetarian between the ages of 7 and 12, then became vegetarian again 2 or 3 years ago). I like the idea of veganism and would love to be vegan but I think I would be best doing it gradually. I'm cutting out dairy a little bit at a time and starting to make mostly vegan meals. This book really makes being a vegan look a lot easier and less scary because it's fuss-free, doesn't use fancy ingredients and has over 100 vegan recipes that genuinely all look delicious. I'll probably keep you updated on how I get on cutting out dairy if that's something people want to hear about. Anyways, this looks like an amazing book and I can't wait to try out the recipes. Do you have any favourite cookbooks? Have you tried any of these ones? I own one cookbook which is a Student Cookbook I bought 2 years too early. I'm also vegetarian. Great for you for really sticking with the lifestyle! A bunch of my friends have seriously tried but none managed. It's easier for me, because I've always been this way. I've never eaten meat, and I stopped eating fish at around age 8. Your cookbooks look great! I myself am a terrible cook, but the one cookbook I absolutely love is 'Eataly'. If you like cooking Italian, I definitely recommend it, although not all recipes are vegetarian, so it takes some creativity replacing the ingredients with vegetarian alternatives sometimes.